•Helps improve your mood and your ability to handle stress. •Presents a message to the people with whom you meet and interact. •Helps prevent injury and pain (headaches, back pain, etc). •Allows your organs to work more optimally. Slouching presses on the intestines and can interfere with digestion. 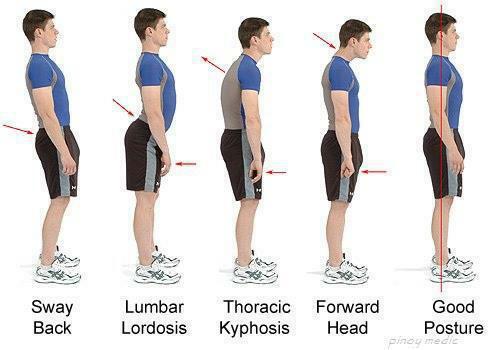 And poor posture can affect your breathing. •Makes you look thinner and healthier. How are you presenting yourself to the world? Are you slouching? 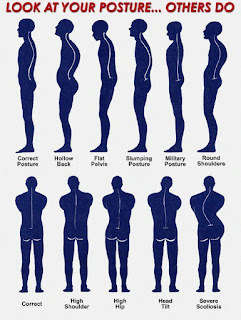 Do you have chronic pain related to your posture? Do you notice your hands and feet go to sleep (numbness and tingling)? •Stand barefoot in front of a full-length mirror or have someone take a full body picture of you. •Notice your alignment starting with your feet, ankles, and working your way up your body. •Do you stick out your chin? Is your nose pointed up? What do you notice? •When you look at your side view, your shoulders, hips, knees and ankles should all be in alignment. Are they? •Does your weight feel equally distributed on your feet? •Also, you can try standing against the wall to notice how straight your spine is or isn’t. 1. Stand up straight with your spine as aligned as possible. Realize your spine has natural curves. It bends in at the neck, out a bit mid back and inward at the lower back. This design helps our body absorb impact when we move around. 2. Tighten your transverse abdominal muscles when sitting and standing. These are the deepest of the abdominal muscles. They help stabilize your pelvis and spine. Most people focus on the rectus abdominal and oblique muscles when they do abdominal work outs, but these transverse muscles are also very important to help maintain good posture, look good and prevent back pain. To tighten these muscles exhale and pull your belly button toward your spine. You can also do the plank position and hold – be sure to pull in your belly while you’re doing this and keep it tight, but don’t forget to breathe! 3. Aim for even weight distribution on your feet. 4. Don’t lock your knees. 5. Pull you shoulder blades back and down. 1. Keep both feet on the floor (legs uncrossed). 2. 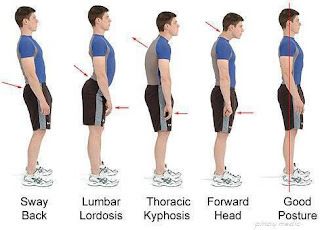 If you spend time at a computer, notice what your posture is like. 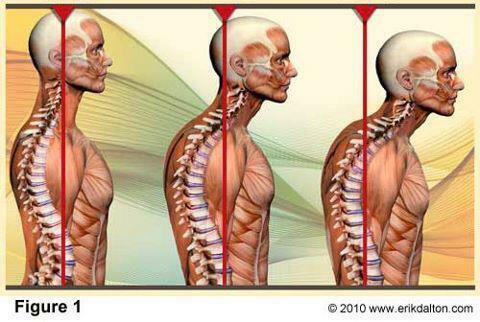 Your spine should still be straight – you should be looking straight ahead and your shoulders should be relaxed. 3. Adjust your chair, table and/or keyboard to help set you up for good posture. 1. How can you adjust your mirrors and your seats to maintain good alignment? 2. If your car doesn’t have lumbar support, try a small pillow behind your lower back. The things you carry – How heavy is your hand bag, backpack or laptop bag? Can you carry less? What do you really need to carry around? Switch sides as often as possible instead of always carrying on one side. 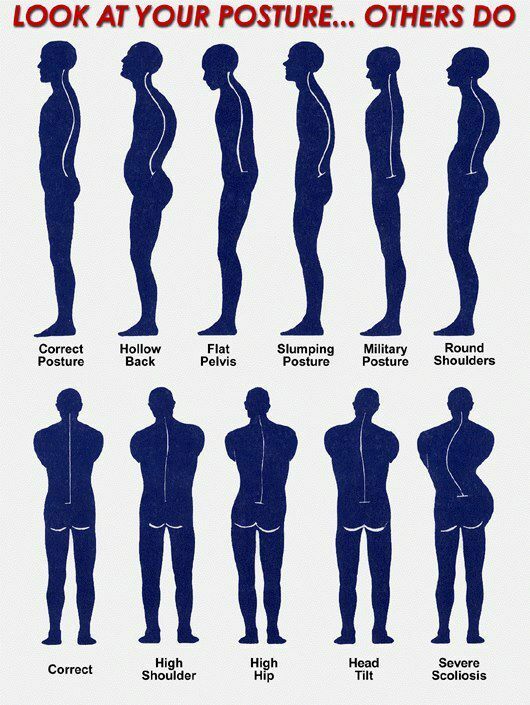 Bad posture habits cause structural changes that can take a while to truly correct. It may take time, so be patient. Today, take ten minutes to notice what good posture feels like. And, when you have time throughout the day, notice your alignment and bring your awareness to correcting it. Try lying flat on the floor to relax all your muscles at least once a day and breath deeply. Really nice blog, this blog is about Posture corrector review. I really like this review. I’ve also get an incredible review about Posture corrector in WorkoutGadget.com . Cheers..